Your feet bear the burden of your body throughout the day, as you move around performing everyday tasks. At the end of the day, your feet are aching, tired and desperate for relief. Sometimes, your feet may hurt because you sprained an ankle or tore a muscle. At other times, your foot pain may be caused by wearing tight and uncomfortable shoes, especially heels, for long periods. Consequently, one of the most important and simple things to do to prevent foot pain is to wear comfortable shoes with soft soles that gently cushion your feet. Other factors that can cause severe pain in your feet include corns or calluses, conditions like arthritis or gout, and ingrown toenails. Foot pain can be extremely debilitating, stripping you of mobility, especially in cases of a sports-related injury. If you put further strain on your foot without consulting a doctor or taking steps for treatment and relief, it can result in permanent damage. It is best first to understand the cause of pain and then go for treatment. However, some primary care tips can be implemented in all cases. You can go forward with the RICE (rest, ice, compression, and elevation) method to comfort yourself. You can follow five simple and effective remedies and exercises thereafter to relieve foot pain. If your feet ache because you’ve been standing all day or trekking over the weekend, then we recommend using a warm compress to relieve foot pain. 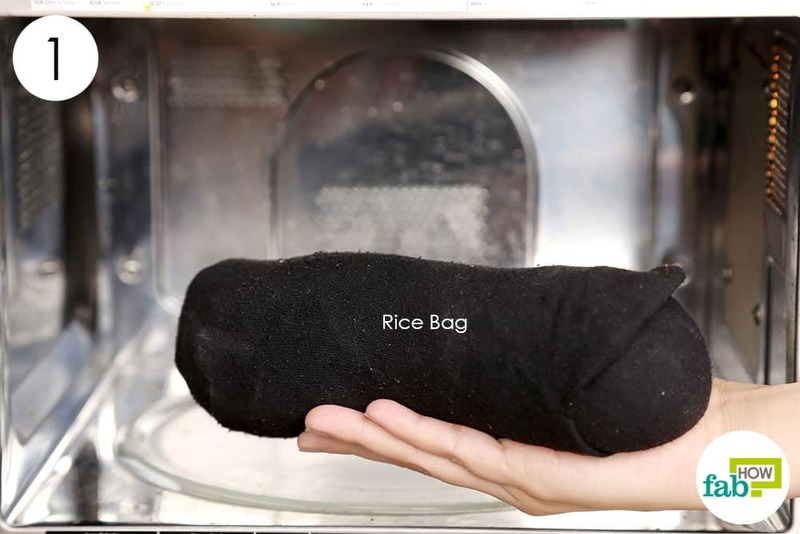 Prepare a rice compress by filling an old sock with uncooked rice grains. Heat your rice compress in the microwave for 1 minute. Wrap your warm rice compress around your foot for pain relief. Reheat and reapply until the pain is gone. If your foot pain is caused by a sports-related injury or any other injury involving a bruised bone, a sprained ankle or torn muscles, apply a cold compress for pain relief, especially during the first 48 hours. 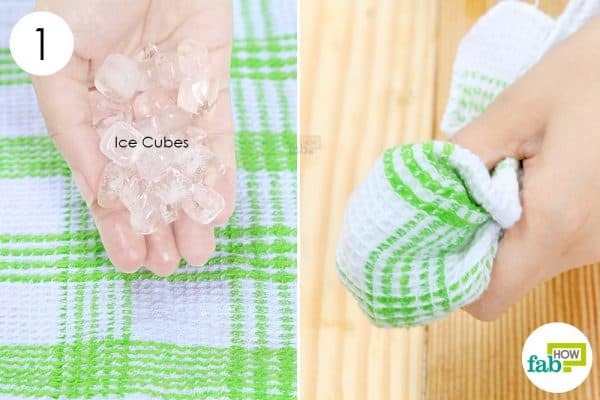 Put some ice cubes on a clean, thin towel. Bring the ends together and bundle it all up to form an ice pack. Gently press the cold compress against the injury. Apply it for 3 to 5 minutes; then remove it for 2 minutes and reapply. Repeat as needed to get relief from foot pain. 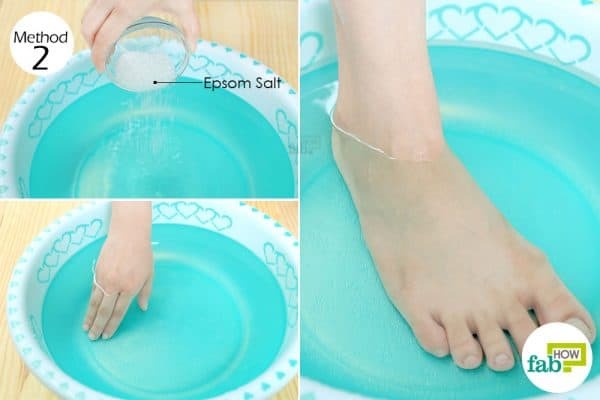 Measure out ¼ cup of Epsom salt into a bowl. Fill a footbath or small tub with warm water. Add the Epsom salt and mix it around with your hands until it dissolves in the water. Soak your feet in the warm salt bath for at least 20 to 30 minutes. You can do this daily to get relief from aching feet after a long and tiring day. In fact, you can also add Epsom salt to warm or hot bathwater and soak in it to get relief from overall body aches and sore muscles. 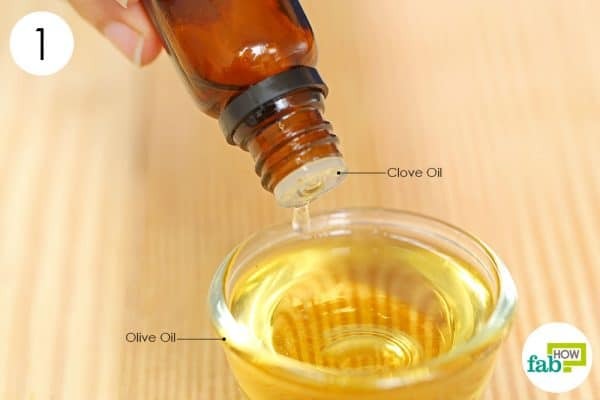 Measure 2 tablespoons of any carrier oil into a small bowl. Add 5 to 7 drops of clove essential oil. 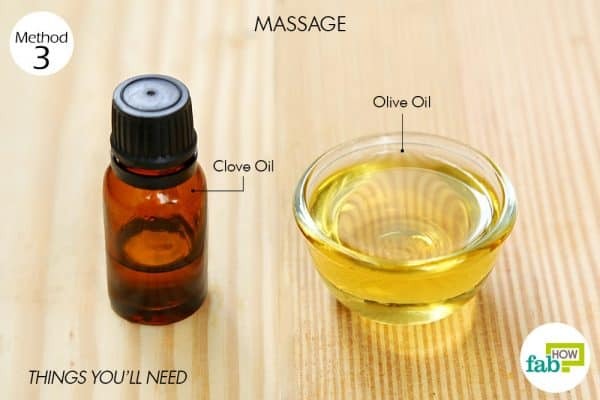 Heat the oil blend in the microwave for 30 seconds. Gently massage it into your aching foot in circular motions. You can apply this oil blend at night after washing your feet thoroughly. Pull on socks and leave it on overnight for pain relief. You can do this daily for 4 to 5 days or until your pain disappears. Hydrotherapy combines the advantages of both heat and cold therapy to provide quicker and more effective pain relief, especially in cases of muscular injuries. Fill one small tub with hot water and another small tub with chilled water. Dip a toe into the hot water to test whether it is at a bearable temperature. If it’s fine, then soak your aching feet in it for 3 minutes. After 3 minutes, remove your feet from the hot water tub and dip them in the cold water. 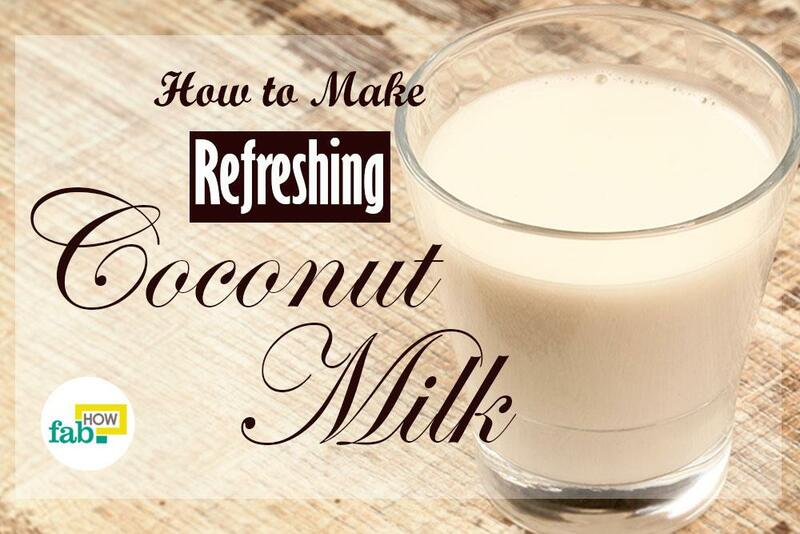 Keep them in the cold bath for 30 to 60 seconds. 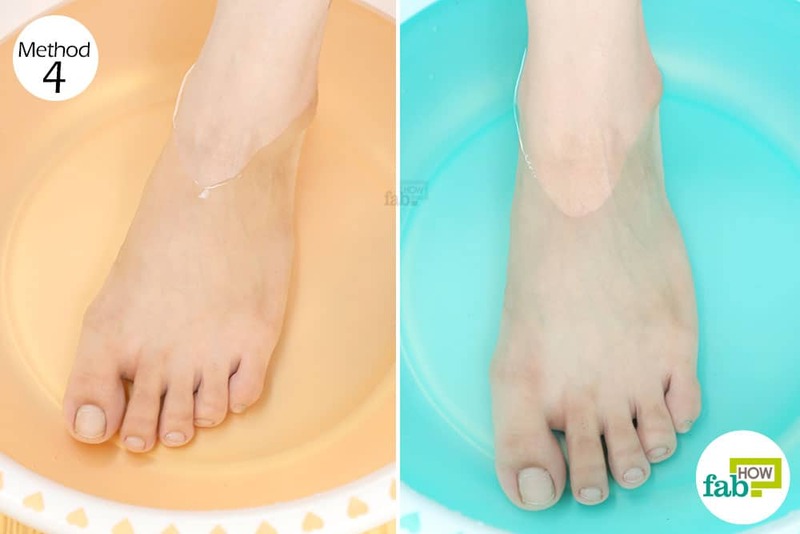 Transfer your feet back into the hot water bath for another 3 minutes. Repeat the process 2 or 3 times to get relief from foot pain. Chronic stress leads to an increase in inflammatory biomarkers called cytokines that cause chronic pain & inflammation. If stress is not mediated, then this cytokine activity can be highly damaging over time. One of the best ways to counteract the stressors of daily life is exercise & yoga (8). Stretching exercises and yoga poses will go a long way in strengthening your foot muscles, along with providing pain relief (9). Stand with your right leg placed forward. Grab hold of some support like a desk and shift your left leg backward. Stretch out your toes so that the tips of your toes are touching the floor. You will feel a pull along the top of your foot. Hold the position for 30 seconds, then rest your left foot flat on the floor. Repeat the steps, this time stretching out your right leg while standing on your left one. Do this daily for about 5 minutes to relieve foot pain. Cross your left leg over your right one, resting your left ankle on your right thigh. Insert the fingers of your right hand in between your toes to stretch them out. Hold the position for 30 to 60 seconds. Do not pull your toes up or down. Repeat the above steps, this time with the right ankle atop the left thigh. Do this once daily for pain relief. Kneel on a soft, padded surface. Keep your knees together and rest your hips on a yoga block. Shift your weight onto your calves, so your heels are touching your hips. Sit up straight, move your hands to your knees and stretch your toes on the floor. The top of your feet should be stretched out flat on the floor. Take deep breaths and hold this pose for as long as you can. Relax and take a break for a few minutes. Repeat 2 or 3 times to get relief from foot pain. Note: Do not force this pose. Sit in the required position for as long as possible and then relax. Start with 1 minute and gradually work your way up to 5 to 10 minutes at a stretch. Place a lightly padded mattress or blanket on the floor, right in front of a steady wall or door. You can place a cushion beneath your hips for extra support. Lie down and take deep breaths. Exhale and bend your knees. Slowly move your legs up on the wall, making sure to keep your spine straight. Place your arms at your sides, turn your palms upward and stretch your legs up on the wall. Slowly inhale and exhale for 10 minutes. To return to the original position, first bend your knees. Then turn your body sideways, take deep breaths and exhale as you gradually rise. You can perform this pose at the end of a long, hard day to rest your aching feet. Note: This yoga exercise is not appropriate for people suffering from glaucoma or high blood pressure. If your foot pain is caused by gout, add 2 cups of apple cider vinegar and ½ cup of Epsom salt to a warm footbath. Soak your feet in it for 20 minutes. You can repeat this daily to keep the pain away. You can also use cayenne pepper for pain relief. It improves blood circulation and acts as a numbing agent to relieve pain. Just mix ½ teaspoon of organic cayenne pepper powder into a small tub filled with warm water. Soak your feet it in for around 15 to 20 minutes. Avoid wearing heels, especially pencil heels, as they can cause unbearable pain. Over time, these heels can also cause certain bones in your feet to shift, leading to permanent damage accompanied by severe pain. If you are overweight and suffer from constant foot pain, adopting a healthier lifestyle and losing the extra weight can help reduce the burden on your feet. Treating pain with heat or cold compress. Marshfield Clinic Health System (MCHS). https://www.marshfieldclinic.org/sports-wrap/ice-or-heat. Published 2012. Using Heat and Cold for Pain Relief. www.arthritis.org. https://www.arthritis.org/living-with-arthritis/treatments/natural/other-therapies/heat-cold-pain-relief.php. Petrofsky JS, Laymon MS, Alshammari F, Khowailed IA. Evidence-Based use of Heat, Cold and NSAIDS for Plantar Fasciitis. OMICS International. https://www.omicsonline.org/open-access/evidence-based-use-of-heat-cold-and-nsaids-for-plantar-fasciitis-2329-910X-2-140.php?aid=28451. Published June 5, 2014. Warm Water Works Wonders on Pain. www.arthritis.org. https://www.arthritis.org/living-with-arthritis/pain-management/tips/warm-water-therapy.php. Deep Tissue Massage for Plantar Fasciitis. Pacific College. https://www.pacificcollege.edu/news/blog/2014/12/05/deep-tissue-massage-plantar-fasciitis. Published April 9, 2017. Sánchez AMC, Peñarrocha GAM-, -Palomo IL. Hydrotherapy for the Treatment of Pain in People with Multiple Sclerosis: A Randomized Controlled Trial. Evidence-Based Complementary and Alternative Medicine. https://www.hindawi.com/journals/ecam/2012/473963/. Published July 14, 2011. Sylvester KL. Investigation of the effect of hydrotherapy in the treatment of osteoarthritic hips. Clinical Rehabilitation. https://journals.sagepub.com/doi/abs/10.1177/026921559000400307. Published August 1, 1990. Tian R, Hou G, Li D. A Possible Change Process of Inflammatory Cytokines in the Prolonged Chronic Stress and Its Ultimate Implications for Health. The Scientific World Journal. https://www.hindawi.com/journals/tswj/2014/780616/. Published June 3, 2014. Lee JH, Gak HB. Effects of self-stretching on pain and musculoskeletal symptom of bus drivers. Journal of Physical Therapy Science. https://www.ncbi.nlm.nih.gov/pubmed/25540496. Published December 2014. Women often suffer foot pain which is because of their footwear that does not fit properly. It causes calluses and bunions. The simplest way to relieve foot pain is to avoid such wearing. These five ways might be helpful but massage with a specific technique can be more curative.